The hairpin is a tad longer than 3-1/2", not counting the loop, and is cast from lead- and antimony-free pewter, making it perfect for ladies with sensitive skin. 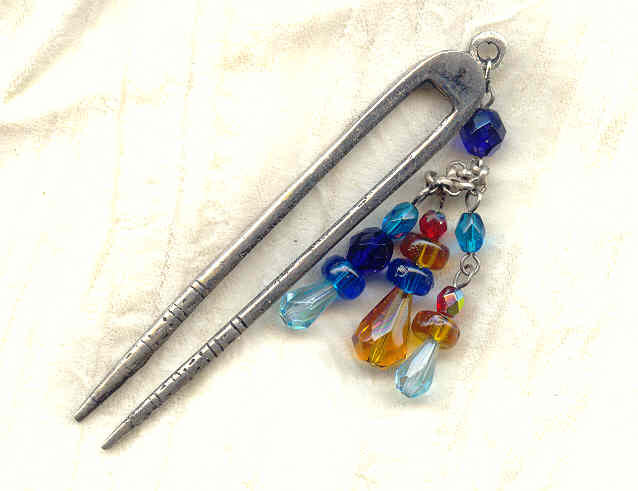 I've added a tassel of topaz, Siam ruby and various shades of blue firepolish crystal to make an embellishment 2-1/4" long, counting the chain. Colourful and playful, and yet so very pretty; just what you'd expect from SPARKLE PLENTY. Fabulous vintage beads and innovative styling team up in this pseudo-Victorian swag necklace.